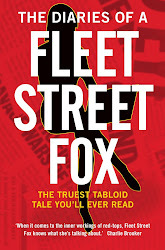 fleet street fox: Purpose (n.): A reason to exist. SKYDIVING is possibly one of the most pointlessly silly things you can do. Exiting a perfectly-working aeroplane in no danger of turning into an airborne fireball is, to start with, very silly. Plummeting towards the Earth at great speed and putting your faith in nylon is, again, pretty silly. Doing it repeatedly would seem to be so silly it's near-suicide, but thousands of people do it every day anyway. And there's no point to it. Jumping out of aeroplanes doesn't improve our knowledge, doesn't ornament the world particularly, and doing it regularly turns normal human beings into adrenaline-crazed whackos who think Russian roulette is too boring. That's what I always thought, and one day I was invited - kindly, it must be said - to jump out of a plane. I repeated the above arguments loudly, for days. I refused point-blank, and was told at length about safety standards and reserve chutes and how you're perfectly safe even if your tandem instructor dies in mid-air. Then I got really, really drunk, and with the kind of hangover which made death a welcome risk to take I got in the plane, strapped myself to a strange man, and was so scared looking down that I insisted on doing a backflip rather than dangle out of the door. It is the only time I've ever been afraid to fly - not because I feared the plane, but I worried about how safe my route back to the ground was. And once I was down, I was very clear that while it had been utterly exhilarating and great fun, safer than I'd feared and a sure-fire hangover cure for which I was very grateful, the experience would not be repeated because it was also terrifying and doing it twice was tempting fate as far as gruesome death was concerned. Every time that I have boarded a plane since, I have been extremely grateful to know that I did not need to jump out of it - and felt slightly safer knowing that, if I had to, I could. This weekend Felix Baumgartner managed to do something which seemed even more pointless and silly. For no real reason beyond the fact he wanted to give it a go, he caught a balloon 24 miles up into a bit of the stratosphere so thin it was almost the vacuum of space. Three times higher than a cruising aeroplane, in a capsule and pressure suit which cost hundreds of thousands of pounds to design and develop, he opened the door, took a look at an Earth which his perspective made seem no bigger than a desk, and jumped out. It was not as silly as it might seem, because if he hadn't done it the balloon his capsule was attached to would eventually have collapsed and he'd have plummeted back to the ground anyway, surrounded by tons of screaming metal. Still, he jumped, and did something so far only theorised in Star Trek movies. As well as setting a handful of records he hit Mach 1.24, travelling at 833 miles an hour, which is one and a quarter times the speed of sound. At one point he briefly went into a flat spin, which is when your arms and legs spin around your torso so wildly all the blood rushes to your head and it can explode, but he recovered. Then he landed, and there's lots of trumpeting his record while at the same time people wonder what the point was and think it seems to have been a very silly thing to have spent so much time and money on. Which on the one hand, it is. Felix may be a very brave professional base jumper but he's probably someone you can only live with if you're prepared for near-death experiences to be a regular part of your life. The footage of his poor mum watching at mission control made me think he'd probably knocked 10 years off her life. But the thing about parachutes is that, while using them for fun may seem daft, it's only because there are loons who do that which mean that the rest of us can put our faith in them on the rare occasions we really need to. Because of your average skydiver jumping out of aeroplanes 20 times a day, it's much safer than you'd think. There are pressure gauges, reserves for the reserve, rules, technology, and lots of other things that make it not quite as bonkers as it sounds for the simple reason skydivers want to survive so they can get back in the plane and do it again. Parachutes don't get handed out on passenger jets, but they made it safe for people to start using planes more often which then, in turn, became so safe they didn't need parachutes any more. And what Felix did has just as much point, because his jump could potentially help us all go into space one day. Because he was able to survive such massive speeds, because they designed a suit capable of keeping him alive with only two per cent of the pressure he's evolved to deal with, because they stopped his blood boiling, his heart cooking on the inside and his eyeballs being smeared all over the inside of his visor, because of all those things, YOU are one tiny step nearer a holiday on the Moon. You're never going to get there, you see, until it's safe and simple. That means there needs to be a cheap method of mass transport and a reasonable chance of escape if it all goes horribly wrong. Until now the only way off the planet was sitting on several million pounds of burning fuel to escape gravity, and the Challenger disaster in 1986 proved that when that goes wrong you're stuffed. Now, perhaps, we could all catch a balloon to the stratosphere for an hour or two then transfer into a shuttle, where with much weaker gravitational forces we could putter over to the Sea of Tranquility without setting fire to ourselves. And if we need to escape, well it would take only ten minutes to get home, there are ways of stabilising a flat spin, and we know we could do it without our internal organs boiling, baking or bursting. There are a million more steps yet before we get to book that trip on a BOGOF deal at Thomas Cook, not the least of which is reducing the cost of space tourism from the £20m-a-head price tag it currently enjoys. Maybe if we're very lucky we'll get to do that, thanks to Felix. Maybe it will never happen in our lifetimes, and our children will get to spend a week bouncing around on a lump of cold rock while their offspring say they're bored and ask when it's time to go home. But we are one tiny step closer - you and me, us, not astronauts, nothing special, not keen on jumping from great heights without good reason, just normal people - to going into space, just for the fun of it. It may be very silly, but that's what they said about lightbulbs. You don't need to have a point when you have a purpose.